A Cash Out Refinance and a Home Equity Line Of Credit (HELOC) and a Home Equity Loan are some of the ways that homeowners can tap into their equity to pull funds. Home equity is the portion of the home that homeowners actually own. Home equity can go up or down depending on the value of the home. If your home value goes up, that means that you now have more equity. Even if you didn’t pay that much for your home, your equity has increased because if you were to sell the home, you would get that extra value. Unfortunately, the same thing applies if home values were to decrease. If the value of your home were to go down, you have now lost equity even if you’ve already paid off a certain amount of your principal (the amount you borrowed from your lender without the added interest and insurance). Similar to a HELOC and a Home Equity Loan, a Cash Out Refinance helps homeowners tap into their equity to get money quickly, but with a cash out refinance, it is a refinance on your existing loan. Cash out refinancing is when you refinance your home and take out a loan for more than what you currently owe and then you would take the difference in cash to use it for whatever you need. You will receive this as a lump sum and since this has been accounted for in your new mortgage, you will be paying it back with your new monthly payments. There is a limit to how much you can borrow. For most cash out refinances, the limit is usually 85% of your equity. Cash out refinances typically have a fixed interest rate, so you will not have any surprises. You will have the same monthly mortgage payment amount every month until the end of the term regardless of inflation or rates skyrocketing. There is a limit on how much of your home equity you can tap into for a cash payout. Because of this limit, and the closing costs that are associated with any new loan or refinance, it is best that you have built up enough equity before tapping into it for money. Closing costs are typically 2%-5% of your loan, which can cost you several thousand dollars. If you don’t have much equity built up in the first place, a cash out refinance probably isn’t in your best interest at the moment. If you only have $10,000 in equity, you are limited to taking out about $8,500. Depending on how much your loan amount is, you could be getting very little or no money back at all after paying the closing costs for this refinance. This is a great option if you have been making payments diligently for many years and your home value has slowly been increasing as well. Another thing to keep in mind is that because you are refinancing your existing mortgage into another mortgage, if you were to end up with less than 20% equity in your property, you will have to pay a FHA Mortgage Insurance Premium (MIP). This is the same concept as a FHA Loan, which allows homeowners who don’t have 20% as a down payment to purchase a home. Since they are putting down less than 20% and have less than 20% equity in their property, they are required to purchase MIP. MIP, however, is not permanent and is no longer required once the loan has been paid down to 80% or less of the original value of the home. A Home Equity Line of Credit is very similar to a cash out refinance, also letting the homeowners tap into their home equity for funds. However, unlike the cash out refinance, a HELOC does not give the homeowner a lump sum. A HELOC functions very similarly to the likes of a credit card, giving you a line of credit as the name says. 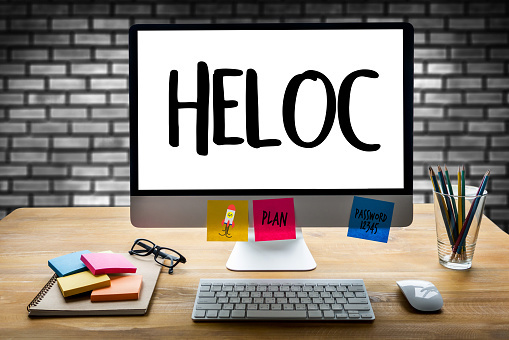 Since a HELOC does not give the homeowner a lump sum of cash, the homeowner can use their home equity through writing checks or even with a designated credit card. An advantage to a HELOC is that the borrower only has to pay back the money that was borrowed. This means that if the borrower does not withdraw the maximum that the HELOC allows, then the borrower can get lower monthly payments! A HELOC has a “draw period” meaning that there is a time limit to how long this line of credit is available for use. The draw period for a HELOC is typically 10-15 years, so there is plenty of time to use it if needed. Also different from a cash out refinance, the interest rate with most HELOCs are adjustable so the monthly payments for a HELOC won’t be the same until it is paid off. During the draw period, the borrower is only required to pay back the interest. Once the draw period is over, the borrower will now have to pay back the principal and the interest and since the interest rate is adjustable, your payments will most likely fluctuate. Also, with most lenders there is a minimum to how much the borrower can withdraw, so even if they don’t need much at the time, they are required to withdraw more money than they need. Since a HELOC is a line of credit that functions as a credit card, you might be required similar fees normally associated with a credit card in addition to the closing costs of the loan. Examples of these include an annual fee, membership fee, or transaction fees. With a HELOC, there is also a limit as to how much equity you can use. It is commonly 80%-90%, which is a little bit more than you can get if you were also considering a cash out refinance. Also, since a HELOC is a separate loan, you will also have to deal with 2 monthly payments whereas with a cash out refinance, you have refinanced your existing loan so you would only have one monthly payment to deal with. A Home Equity Loan is the most similar to a cash out refinance. Like a cash out refinance, a home equity loan gives the borrower a lump sum to cover any large purchases or pay a good portion of any high interest debt that might have been slowly accruing. There is also a limit to how much equity you can tap into for cash, but with a home equity loan some lenders will let you borrow up to 90-95%. Like a cash out refinance, your interest rate and monthly payments are fixed, so you will be paying the same amount each month, unlike a HELOC. What is the Difference Between a Home Equity Loan and a Cash Out Refinance? A home equity loan and a cash out refinance are the most similar products because they both allow the homeowner to tap into their equity to pull out a lump sum of cash. They both have fixed interest rates and the monthly payments for both are fixed. Although they seem like the same product, there are several differences. A cash out refinance requires the homeowner to refinance on their existing mortgage. Since the new amount of this refinance includes the principal amount that the homeowner hasn’t finished paying off, this can affect the closing costs associated with it. Closing costs are usually 2%-5% of the loan and since the amount of this new mortgage is higher than a home equity loan, the closing costs with a cash out refinance will be higher. Additionally, since a cash out refinance is simply refinancing their mortgage for a larger amount, they are able to write off the interest. A home equity loan and HELOC are separate loans that are taken out in addition to the homeowner’s existing mortgage, so closing costs will be cheaper for those. Because a home equity loan is a separate loan that is taken out in addition to the homeowner’s existing mortgage, the homeowner now has to deal with an extra monthly payment each month. This is what is commonly referenced to as “a second mortgage.” With a cash out refinance, the entire loan has been refinanced to accommodate the equity that has been cashed out, so there’s only one monthly payment to deal with.